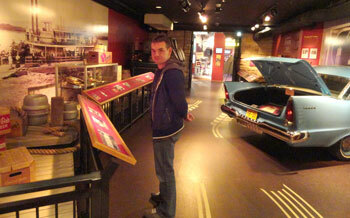 Vintage Potosi sign and collection of beer memorabilia in the National Brewery Museum. Over the long holiday weekend, we decided to continue our Memorial Day tradition of visiting a Wisconsin brewery. Last year it was New Glarus Brewing. 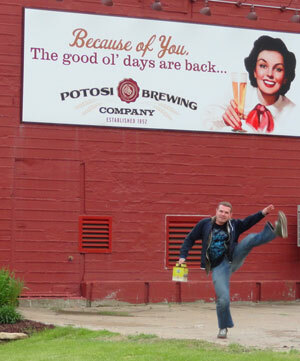 This year we headed to Potosi, just across the Mississippi from my hometown, to visit the Potosi Brewing Company and National Brewery Museum. The highlight of course, was bellying up to the large horseshoe-shaped bar in the first-floor brewpub and restaurant. The $5 museum admission includes a complimentary 8oz pour of beer. Six sample sizes of anything they have on tap will only set you back $7. A one-gallon growler goes directly from the tap into your hands for $15. There is also a full food menu. 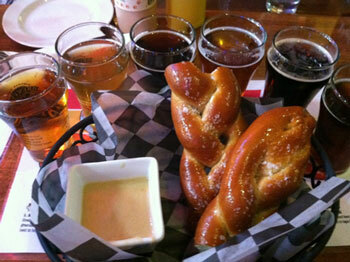 We found the warm pretzels with beer/cheese sauce and hot mustard to be a perfect compliment to sampling. Luckily for us, unlike “Only in Wisconsin” New Glarus, Potosi has recently entered the Chicago retail market and is available at Binny’s stores. We did, however, take advantage of our drive through Dickeyville, WI, to stock up on our favorite New Glarus products at the local grocery store. The fridge is ready for summer. Cheers. This entry was posted in Destinations and tagged National Brewery Museum, New Glarus Brewing, Potosi Brewery, Potosi Wisconsin. Bookmark the permalink.